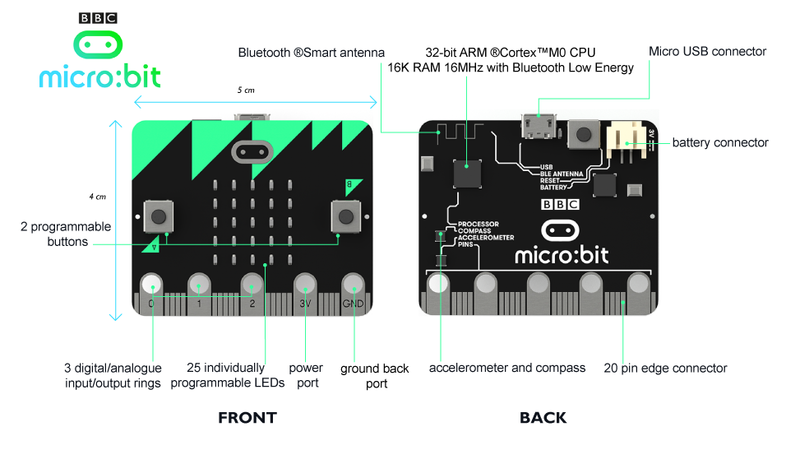 The Micro Bit measures 4 × 5 cm the device has an ARM Cortex-M0 processor, accelerometer and magnetometer sensors, Bluetooth and USB connectivity, a display consisting of 25 LEDs, two programmable buttons, and can be powered by either USB or an external battery pack. The device inputs and outputs are through five ring connectors that are part of the 23-pin edge connector. Nordic nRF51822 – 16 MHz 32-bit ARM Cortex-M0 microcontroller, 256 KB flash memory, 16 KB static ram, 2.4 GHz Bluetooth low energy wireless networking. The ARM core has the capability to switch between 16 MHz or 32.768 kHz. NXP/Freescale KL26Z – 48 MHz ARM Cortex-M0+ core microcontroller, that includes a full-speed USB 2.0 On-The-Go (OTG) controller, used as a communication interface between USB and main Nordic microcontroller. NXP/Freescale MMA8652 – 3-axis accelerometer sensor via I²C-bus. 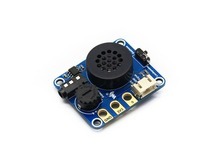 NXP/Freescale MAG3110 – 3-axis magnetometer sensor via I²C-bus (to act as a compass and metal detector). MicroUSB connector, battery connector, 23-pin edge connector. Display consisting of 25 LEDs in a 5×5 array. Three tactile pushbuttons (two for user, one for reset). I/O includes three ring connectors (plus one power one ground) which accept crocodile clips or 4 mm banana plugs as well as a 23-pin edge connector with two or three PWM outputs, six to 17 GPIO pins (depending on configuration), six analog inputs, serial I/O, SPI, and I²C. Unlike early prototypes, which had an integral battery, an external battery pack (AAA batteries) can be used to power the device as a standalone or wearable product. The Python programming experience on the Micro Bit is provided by MicroPython. 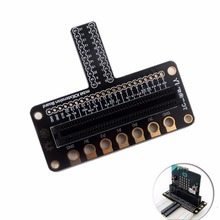 Users are able to write Python scripts in the Micro Bit web editor which are then combined with the MicroPython firmware and uploaded to the device. 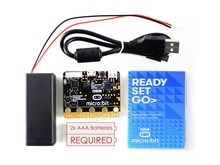 Users can also access the MicroPython REPL running directly on the device via the USB serial connection, and this allows to interact directly with the Micro Bit’s peripherals.